Deep step-through, maximum comfort, and safety. 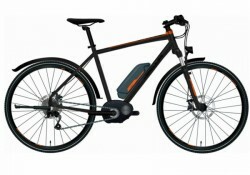 The Corratec e-bike E Power Active 10S 400 (Wave, 28 inches) with 10 gears derailleur (Shimano XT) is the pedelec for city and surroundings. The worldwide safest Corratec eBike frame (Fusion Tube Edge) offers a maximum safety while shopping and cycling. The Corratec e-bike E Power Active 10S 400 (Diamond, 28 inches) is equipped with a 10 gears Shimano XT derailleur and the latest Corratec innovations like the "Fusion Tube Edge" frame construction and the "Integrated Engine Technology". The Corratec e-bike E Power Active 10S 400 (Diamond, 28 inches) races across the roads in its sporty silver design. 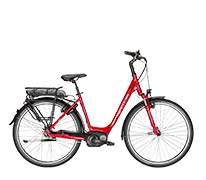 Being equipped with the effective Bosch drive technology (including 400 Watt battery) and backpedal brake, you cruise relaxed across the city with the Corratec e-bike E-Power Active 8S Coaster 400 (Diamond, 28 inches). Highest safety and best cycling conditions are provided by the "Fusion Tube Edge" frame, which presents the most stable and safest frame construction of Corratec up to now thanks to the reinforced edge in the inner tube. "Integrated Engine Technology" makes the complete integratrion of the Bosch motor possible; the engine protector serves as cover and protects from stone chips and other outer influences! 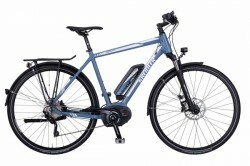 E-bikes is strongly in the ascendant. Sales figues prove every year: E-mobility is in. E-bikes are not just fine for older or people who seldom work out. Pedelecs, the correct name, do not relieve you of pedalling. The bikes with electric motor offer a pedal support. Pedalling is not completely relieved of you but facilitated. Even among younger people, electric bikes catch on in a huge way. This is given by a precious design and technological innovations, making cycling a pure pleasure. Try our product filter so you can find the appropriate e-bike. Due to the trend towards e-bikes, the market has become unclear in the meantime. 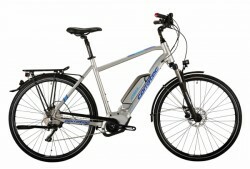 We offer a selection of very high-quality e-bikes of renowned manufacturers. The manufacturers of the e-bike shop are quality manufacturers, which are characterized by experience, innovation, and highest fabrication standards. Our shop offers top e-bikes of different tyre sizes, frame shapes, and frame heights. How to determine the right e-bike-size, can be read in our e-bike guide. 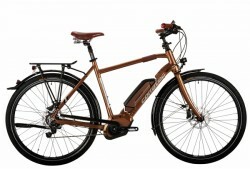 E-bikes are the ideal companion for many occasions with their integrated motors: for everyday tours like the way to work, for tours in the open or tours in the open country. Under ideal conditions, an e-bike battery offers a range up to 130 km. This is made possible by the latest generation of lithium ion accumulators. This have a much longer charge capacity and are designed for much more charge cycles. 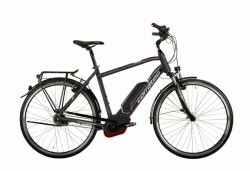 The selection of e-bikes is big, so that everybody can find the appropriate model. By now, even younger people have discovered pedelecs. They appreciate the comfort and the design of bikes with motors. E-bikes offer you and old, sporty persons and those seldom working out an independent means of transportation, which is eco-friendly as well. Either conquering the hill to your apartment coming form the inner city of Stuttgart or making a cycling tour along the channel coming from the inner city of Kiel. Pedelecs mainly differ in use and shapes of frames. There are e-bikes, i.e., which are optimized for everyday use on shortest tours, i.e., in the city. They offer highest comfort for short distances. Shoppings are easily transported and the way to work is easily handled. Trekking e-bikes offer best cycling features for longer distances and in light open country. 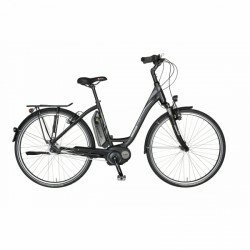 They the sporty variety of the city e-bike and are suitable for shorter tours as well as long cycling tours. Sport e-bikes are designed for use in the open country and for sport-oriented cycling. They are more sturdy, have thicker tyres, and some things are forgone. Most e-mountainbikes do not have splashguards. Three shapes of frames have established: the diamond frame with the high middle bar is the classic bike for men, it offers the best proportion of stability and weight. Pedelecs with the trapezial frame stand for classic women bikes. Here, the top tube is lowered. Of course, given gender should not keep you from choosing other frame shapes. 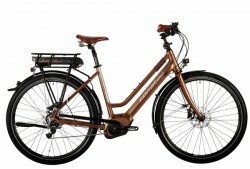 The most popular frame shape of e-bikes is the wave frame. Its name originates in the curved down tube, which reminds of a wave. It has a very deep access, making getting on very easy. 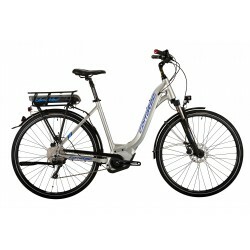 E-bikes with wave frames are the right choice for women and men, who attach greatest importance to comfort. We recommend other shapes of frames for sporty use. Furthermore, there are many little details, making your e-bike YOUR individual tour companion. Some pedelecs, i.e., offer a start support, which is suitable for weaker persons, because the start resistance is much higher. There are pedelecs with automatic, hub gears or derailleur gears. It's your choice ! Find your personal e-bike.